Building an effective online training program requires packaging the right content with the right type of learning experience. However that often doesn’t happen because it’s easier to pull a lot of information together, create some slides, and then publish a course. To top it off, many of these types of online courses are merely repacked content that already exists on the organization’s network. So instead of building a real learning experience, we’re just repurposing existing content. Do You Need Online Training? Do you you really need to build an online training program if all you’re doing is repurposing existing content? Is this adding real value? Most likely you don’t need the course (or at least not that type of course). But often those courses get built anyway and that wastes the person’s time and the organization’s money. How to Avoid Wasting Time & Money for Online Training? When I consult with a client I always try to determine if the training program has a direct link to the organization’s business goals. If so, then it’s easier to find the right training intervention (assuming it’s needed) and then aligning it to the correct measure. That’s how you get your return on investment, by the way. For those new to this, follow a simple performance consulting model where you can determine where things are currently, where they should be, and how to bridge the gap that exists. 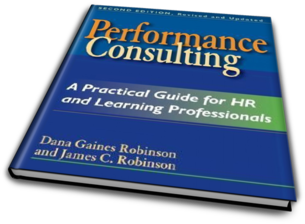 I always recommend the Performance Consulting book because it’s straightforward explanation of the process and easy to implement. In an ideal world, you and your client come up with a solution that works. Unfortunately, often the client wants to build an online training course regardless of whether or not it’s linked to the organization’s goals. The first step is to avoid building the wrong course (if any). That’s why you wear the hat of performance consultant. But sometimes you still have to build a course. Is so, what’s the best plan? Going back to the original scenario, you have to build training but the content already exists online. Here are a few viable options. Create an abstract of the existing content and publish as a PDF. Don’t waste time building a “course” that’s merely content easily accessed in other places. In those cases, focus on simple job aids that can be used at work. This contents the content to the learner, but doesn’t overwhelm them with a bunch of information. Another option is to create a summary or abstract of the key information. Then point them to the more detailed information online. This way they have a simple overview and access to more information if they need it. Of course, that’s easier said than done. Some clients will still want to create something and a PDF isn’t the solution for them. Build a simple interactive multimedia module. When I have a customer who has to have “elearning” but was just repurposing the online content, I’d use something like the process or tabs interactions in Engage. They looked like a training course, but they really were more like multimedia documents. Because they’re form-based they’re easy to build and maintain. In some ways, they’re even easier to build than a PDF because the software does all of the visual design and formatting. Another advantage is that they can easily be tracked in an LMS. So you get the benefit of a “course” but the speedy production. Change the focus of the training. Since most of the training content is already online change the focus of the training. Instead of online training that covers the subject matter, do training on how to find and use the online resources. This also gives you an opportunity to build a community of practice around that training content. You can combine training on using the resources with a peer community of others in the organization who use the same resources. A community lets you capture activity that may be valuable to future learners. The truth is that a lot of online training wastes time because it’s just content that already exists. However, if you have to build online training like this, the tips above should help make it meaningful and more valuable to the organization. How do you get around this type of training? Share your thoughts with the community. Here's How You Can Help Fight Ebola? Love your last point. Letting the “course” promote existing job aids, tools, and info is the way to go in a lot of situations. Building scenarios that put learners in a position where they need to use the resources to solve a problem is a good approach. We use the job aids approach quite a bit. I like the third tip. 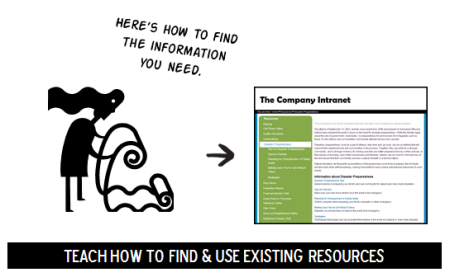 We should train people how to use the company’s internal network to find information rather than build online training that reuses existing content. Good points. Our group’s challenge is that we’re not able to be performance consultants. We’re mostly seen as order takers so we cannot influence the decision makers. By the time we are pulled into the projects, the decision has been made. Awesome post. “Change the focus of the training” the last point makes lot of sense. However as Mike said, we can suggest but when client is treated as god, we hardly will have any chance to make changes in the training decisions. We had a project like you described not too long ago. Jennifer and Mike, one way to convince others is to use your personal time to create a brief sample. I know everyone’s time is booked solid. However, over time and pace yourselves, create an example based on what Tom wrote above. Then, show it to your key stakeholders or managers. The “work sample” approach has helped other ISDs and developers to move their learning organizations and SMEs into the “repurposed” direction once they see that the onscreen e-learning focuses on the key, performance improvement content. Tie it back to the improvements in the learners’ Knowledge, Skills, and Behaviors (from changed Attitudes), the KSAs. I am wondering if perhaps repurposing of existing content is valuable in cases where the existing content is simply not conducive to learning? For example, say there’s a 5 page instruction on something. 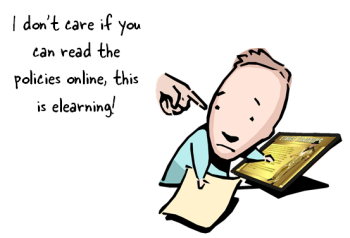 You may be asked to take the exact same information and turn it into an e-learning course. Sure, you’re not adding any more information per se, but by being able to structure it in a more interesting way, you may be able to draw more attention to the most important parts, and just generally create something that keeps their attention longer than having to just read through 5 pages of words. This kind of fits into your suggestion on creating a multi-media module, but I guess my point is that instead of suggesting it as a “work around”, repurposing seems like it has potential to be a value-added process, given that there aren’t other issues leading to the gap that’s trying to be addressed (like motivation, for example). @CN: I think a case can be made that the novelty of the content packaged another way has value. Ideally the course is more than just information. The information should lead to something. If not, then why have the course in the first place? Nice ideas! 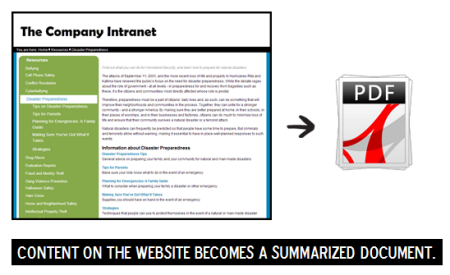 I never thought of “repackaging” our site and wiki as an accompanying PDF or an interactive e-learning module. It’s definitely something I’ll play with in the next couple of weeks. Thanks! This was great advice. I wonder if it would be worth creating elearning as the “in-depth” trainings for certain situations, especially if the “job aid” content is boring or doesn’t really provide authentic practices for more skills based trainings.